Failure on the part of President Maithripala Sirisena and Prime Minister Ranil Wickremesinghe to fulfil their election pledges and the shameful revelations of corruption under the present government could be two of the most important factors that contributed to the sweeping victory of former president Mahinda Rajapaksa’s proxy, Sri Lanka Podujana Peramuna (SLPP). Humiliating second place was for Prime Minister Ranil Wickremesinghe’s United National Party (UNP) while President Maithripala Sirisena’s Sri Lanka Freedom Party was even worse. Fed up and disgusted with the lawlessness of Mahinda Rajapaksa government, accused of widespread crime, corruption, plundering of nation’s wealth, mismanagement and the promotion of communal disharmony, people voted for the Maithripala Sirisena–Ranil Wickremesinghe coalition in the hope they would rescue the country from these evils. In fact this is what Maithri-Sirisena team promised to the country. Beleagured people trusted and gave mandate to them. However three years later today they have miserably failed to fulfil their pledges. There was confusion from the very inception when the government was formed with previous government ministers accused of corruption. Manipulating judiciary shielding these corrupt elements. The irony is that these very same people accused of various crimes were not only free but also began challenging the government. Both President Sirisena and Prime Minister Wickremesinghe were also accused of manipulating the judiciary to protect those accused of corruption. People in general were fed up. Added to this frustration, the ever growing corruption within the Yahapalanaya government made the people sick and tried. The entire country was shocked at corruption involving the bond issue. It was made worse with the shameful disclosures involving Prime Minister Ranil Wickremesinghe. Instead of sorting out burning issues they were more interested during the past three years, in implementing the American agenda in various fields. For example International Monetary Fund was accused of drafting Inland Revenue amendment bill. Many complained that rather attending to urgent issues both present and the prime minister were busy travelling worldwide signing bilateral agreements. Despite winning some seats in this week’s local government elections indications are that the UNP, under its present leadership, will never be able to form a government on its own. The UNP got an opportunity to rule after losing more than two dozen elections. However it has missed the opportunity. They pledged during their election campaign to end racist attacks on minorities especially Muslims. Instead of protection, Muslims who voted in bulk to the government were quick to realize that they were virtually abandoned. The racist attack on Muslims in Gintota showed that anti-Muslim racism remains alive. Foreign policy had no direction. For example the government failed to condemn the genocide of Muslims in Myanmar though even United Nations Security Council took up the issue twice. Economy is in bad shape though the Prime Minister continue to claim otherwise Much talked about foreign investment never became a reality. Even small time traders began saying that routine business dropped though they expected to improve. Meanwhile President Sirisena blaming Prime Minister Wickremesinghe for all economic ills, failures and bond scam corruption in election meetings dealt a destructive blow, perhaps the final blow, to the unity of the government. In fact the sweeping victory for SLPP in last Saturday’s local elections is the outcome of miserable failure of President Sirisena and Prime Minister Wickremesinghe to understand the mood of the people. They will responsible for what is in store for the country in the near and distant future. I thought these guys are going to do some thing for the yaalpaana people. Maithripala more than anyone else deserves blame. The man acted like a child, trying to grab votes from Rajapakse’s ultrahardline camp, not realising those clowns wouldn’t give him a vote even if he resurrected Prabhakaran and shot him in the head himself. He repeatedly tried to ingratiate himself with these sheep, driving away what little chance he had of luring the Sinhala liberal vote. He did absolutely nothing to deal with corruption, instead just creating pointless confrontations with the UNP and bad mouthing his own government’s decisions/policies. As for the UNP, I’m not allowed to swear on these comments. I’ll just point out that the UNP has perfected the art of getting into power then making sure they get voted out almost immediately. You have to admire this level of arrogance and incompetence. It’s truly stunning. Somehow Lankans have been persuaded that the only way to solve our problem is to resurrect the language-religion-divide. Desperate MS did try this but could not match the champions..
Ranilo has once again shown that he is an utter political failure and an Economic dud. Proved he is a mastermind and a crook. A frustrated majority have spoken……….. Presidents/Ranil pre election drama ends in a dismal box office failure..
What has he got for us? Normally the ruling party is under pressure during local elections. SLPP victory was a direct result of Sirisena’s incompetency than the incompetency of the government. Sirisena created the govt by bringing crooks of the last govt that people rejected, he has not fulfilled any of the promises he made. Not corruption, Not Murder or reconciliation. Being in govt UNP has still held its own. TNA really does not have a challenge. JVP has improved but could do better. They should concentrate on the future and not the past. Youth like to vote for something than against. Overall I am ok with the result as Sirisena got what he deserved. Brilliant article, and brilliant title, you hit the nail on the head. Very objective as well, Mr. Farook. Like to hear your ideas on what next: and be realistic, the solution have to work with existing politicians. Why cannot Uwindu be like Lateef? Latheef defend and support Islamic cause whatever national issue! 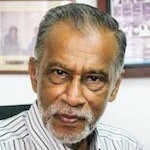 Sinhalese need writers too! Would anyone blame, if a person were to say:- This “Victory Plan” of MR was a “Master Plan” of Ranil Wickramasinghe. ? I say it with reasons. (1) The long lasting bonded friendship developed between MR & RW since the days and years of one holding power regime and the other being set in control of the Opposition. (2) MR’s direct intervention by way of blocking the roadway in front of Srikotha at the most critical moment of RW losing the control of UNP (3) The hush, hush speedy transportation of RW accompanied by none other than Thiru Nadesan – the Deal Maker for MR in the dawn of January 9th 2015 to Temple Trees without the knowledge of the winning candidate MY3. (4) The “Planned” malfunctioning of the “Investigative Units” such as the FCID, CID, AG’s Office; Bribery Commission etc. that were entrusted with the investigations into corruption, fraud, misuse and waste committed during MR’s regime and not setting up those “Special Courts” that were promised. (4) RW’s “secretive” disregard to the authority of the President who was a “Defector” of MR, whom he (RW) considered a “cut throat”. (5) Not initiating any moves to contest the election on the form of an “Alliance” between UNP and SLFP / UPLF. knowing very well going on separate ways will lead to the winning of SLPP led by MR. Many more reasons, but constrains on space prevent detailing those here. MY3: Your fate is in the “Balance” in the presence of this “Unholy Alliance” of RW & MR. Are you aware and prepared to take that “Challenge” ? Let us wait and see. Corruption is ingrained in Sri Lankan politics, that is common knowledge. The issue is that when the corruption is exposed, like the Bond scam, they should be punished.When they came to power and the support for the Rajapakse clan is at low, Ranil&My3 should have exposed the corruption. But everyone is in it. The next Presidential elections are two years away; a lifetime in politics. If the same PM continues, the outcome is predictable. The results of the pending criminal cases if resolved within the next two years will have a serious “predictable” effect, hopefully better, and an important one for the people of the country. MS is most unlikely to contest the next Presidential election; this is predictable.RW is a “almost dead” as the UNP candidate. Surely, time is opportune for fresh and bright young new blood at the political helm. President Mythiripala Sirisena is to be blamed for this debacle for his ‘anti-UNP’ mouth in the platform without knowing that he was only attacking his own Govt. By this childish act, he has ruined both UNP and his own SLFP votes. How could have people voted for this camp when the leader of the same ‘yahapalana’ govt. abused one of their alliances? In some places, his party got same or less votes than that of JVP. whatever the reason ranil and MS did not want to take action against mahinda and his relatives.. that way they cheated the masses and violated their own promises.given at the time of elections. even the victory of MR can be because of some deal. this view is an indication of lose of credibility on the part R and MS.
Over the last 40 – 50 years, ‘corruption’ in Sri Lanka has increased so much in width and depth, in both the public and private sectors, that this form of dishonesty has habituated among the people of this country. No one is seriously affected by the presence or talk of ‘corruption’. Moreover, ‘corruption’ has also reached a stage where it is strongly associated in the minds of people with ‘politicians’ (among others) , so much so that it is now perceived as an intrinsic attribute of any politician. The general belief is that there is no such entity as an ‘honest politician’. This would mean that the use of ‘corruption’ by politicians and political parties to differentiate themselves from their rivals is doomed to fail from the very beginning. This sanctimonious, holier-than-thou approach will cut no ice with the members of the voting public. At the end of the day, what the people need is to be confident that their country is being lead by a strong personality who has the best interest of the country and all of it’s people at heart, who has a clear idea where he is going and knows how to get there. In arriving at their choice of ‘leader’, every voter unconciously performs a very simple SWOT analysis for the purpose of making trade-offs between the strengths and weaknesses of each candidate/party. The ‘corruption’ that the chosen leader subsequently engages in is the price that we as a country have to pay for electing the individual concerned. There is not much point in crying or whinging about it thereafter. President Sirisena was acting like a bull in a China shop these few weeks leading to the February 10th Local Government elections. He was seen lambasting his own Prime Minister Ranil Wickremesinghe. He was badmouthing the Prime Minister day in day out. His action to rescind the interdiction of Brigadier Priyanka Fernando was stupid and outlandish. His oft-repeated remark that he will not send any soldier before a court of law for coming war crimes shows he has no respect tot he principle of rule of law and rules governing the conduct of civil wars. His blunt reply to the parents of the involuntary disappearance of thousands of LTTE cadres after they surrendered smacks of raw arrogance. If they have disappeared, then the government should give rational ec[lnantion. Lately, President Sirisena is behaving like a grown-up child. He was not at all presidential in his speeches. He was attacking the Prime Minister, calling him hora, someone who brought him to power. It is like biting the hand that fed him. On the bond issue the Prime Minister trusted Arjun Mahendran, but the latter let him down. Mahendran had a clear conflict of interest. His son in law Arjun Aloysius was a primary dealer. Why did Mahendran not withdraw from the bond issue and handed over it to his deputies citing conflict of interest? Wickremesinghe is not proving himself as an efficient Prime Minister at all. He raised the salaries of public servants by Rs.10,000 without any regard to the perilous financial situation. He continued the issue of duty-free vehicle permits at a time when the country was saddled with huge loans. In one instance the Finance Minister Ravi Karunanayake issued a special gazette notification exempting 30 persons from paying duty on import of vehicles. Why did he do it? Why he favoured these 30 (28 Sinhalese and 2 Tamils) persons who are not eligible for duty exemption. As for the clash between Muslims and Sinhalese at Gintota, the government put it down with a firm hand, unlike the case during Mahinda Rajapaksa’s dispensation. The Prime Minister himself went to the spot as soon as the clash broke out. During Mahinda’s time he asked the Muslim businessmen whose stores were attacked by thugs in yellow robes to talk peace with the attackers. We know you are a Muslim but why look at everything from a Muslim point of view.You forget that Sri Lanka consists of Sinhalese,Tamils,Muslims, burghers.What about their issues? Your commentary is jingoistic.